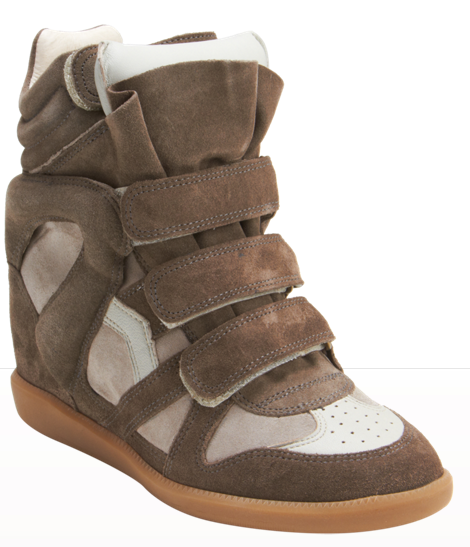 I’ve adored Etoile Isabel Marant’s Becketts since I saw them earlier in the year on such fashionistas as Miranda Kerr. It was only until recently though, when I saw them on friend and head buyer for Blue & Cream, Sam Greenes, that I feel completely head over heels in love with them. After much research I came up empty handed with several hundred “sold outs”. However, on Friday I discovered that Barney’s had them back in stock, in the color I wanted, and in my size! The sheer excitement of finding them though wasn’t enough to make me press purchase. I suddenly realized that though I admired them via pictures and on Sam, personally they would sit on my shoe shelf, gathering dust, and unworn. Plus the extra liftwould make me almost too tall! So alas I didn’t purchase the Becketts, and though I do have a bit of buyer’s remorse, I realize that’s the beautiful thing about fashion, sometimes it’s nice enough to look, but not to touch, xo.